One of my favorite cuts of meat is flank steak because it is fairly inexpensive and while it's a tougher cut of meat, if you cut it and cook it right, it is flavorful, moist and juicy. 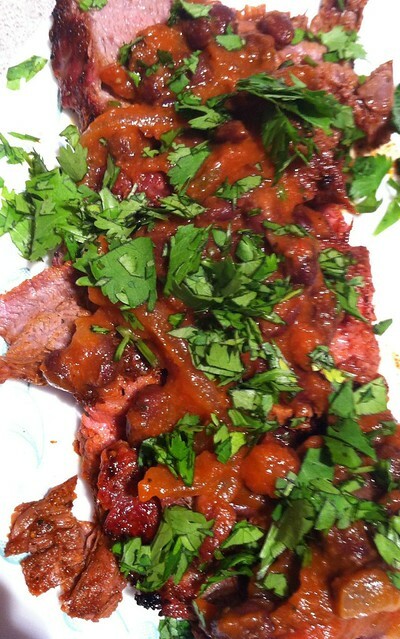 My favorite marinade is this Rachael Ray recipe for Korean Barbeque flank steak but recently I have come to fall in love with the following recipe from Food Network Magazine which is flank steak dry rubbed with chili powder and then topped with black beans and cilantro. It's a quick, simple meal that packs a big flavor punch. 1. Sprinkle steak with chili powder and salt. Heat 1/2 tablespoon olive oil in a large skillet over medium-high heat. Add steak and cook about 5 minutes per side for medium rare. 2. Transfer steak to a cutting board and let rest 10 minutes. 3. Meanwhile, heat remaining 1/2 tablespoon olive oil in the same skillet over medium heat. Add onion and tomato paste, stirring until onion is soft, 2-3 minutes. Add chicken broth and beans and bring to a simmer. Coarsely mash beans with a spoon; continue cooking until slightly thickened, about 4 more minutes. Add salt to taste and garnish with cilantro. 4. Slice the steak and top with black beans.